What happens when you take a bunch of women, and a bunch of men, give them military training, weapons, and ammunition, and then make them live together for a year? Forget polite, things quickly get real. 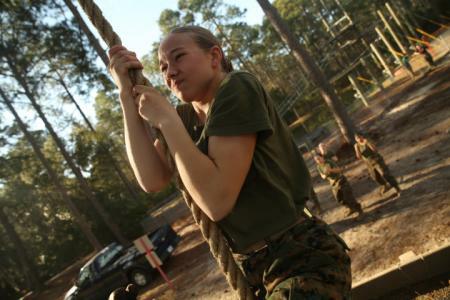 As part of a new initiative to gauge women in combat roles, the Marine Corps intends to field 460 Marines of mixed gender for a several month training stint, all while under the microscope of doctors and scientists from various disciplines. It’s not just a matter of anatomy and biology this time, Marine officials have told Marine Corps Times that they plan to chart the social and psychological progress of the groups as well. 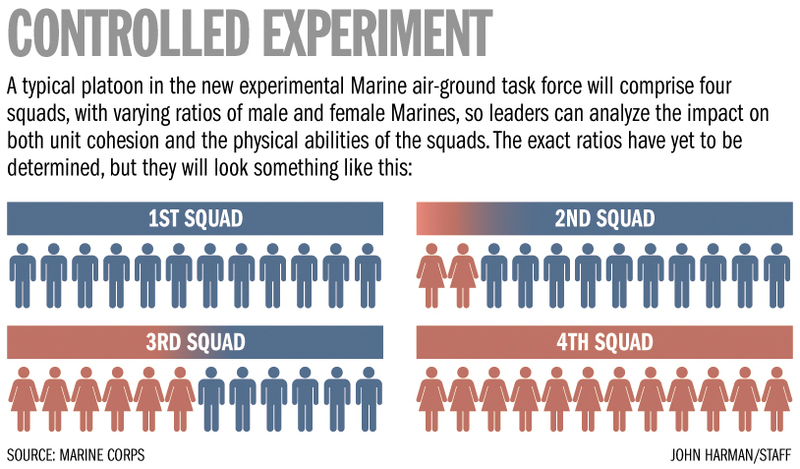 The graphic below shows how they’ll do it: Two controlled squads will be exclusively male and exclusively female, while another will split 50/50, and the last will put women as the vast minority (the likeliest scenario, especially in terms of infantry). The service will team with the University of Pittsburgh to monitor the physical toll the training takes on both sexes over the lifetime of the experimental unit. A partner to study the socialogical impact has yet to be determined. This has nothing to do with science, nothing to do with equality, nothing to do with bettering combat effectiveness and unit cohesion; has everything to do with emasculating the most effective component of America’s shock force, for the purpose of weakening the United States military, so Barack Obama and the Democrats can establish a one-party dictatorship. (First I wish to reply to what Terry said: HAHAHAHAHA; sweetie, loosen that tinfoil hat & get back on your meds.) This program sounds like a very interesting study. As certain aspects of military-might are predicated MORE on technology & LESS on physical strength I predict that women-only groups will be shown to be very effective. Women work better as a team, are goal oriented & interested in the betterment of the group rather than competition among individuals. Psychologically they have an advantage & the military could make good use of their talents. Women can be fierce when it comes to the well-being of those for whom they care. To Terry: I am a female Marine officer (over 25 years) and you are spot-on! The link to “full coverage” doesn’t work and I can’t find the ratios graphic anywhere. In fact, no other publication has described the experiment as anything other than a force comprised of 25% women. Anyone got a link corroborating the info in the graphic?